Akshay Kumar's new film Kesari, which is based on the 1897 Battle of Saragarhi, just dropped its first posters and they are so darn intriguing. 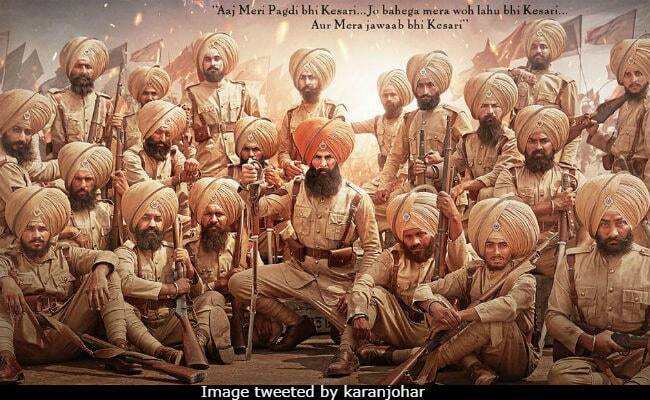 "On Saragarhi Day, here's the first look of Kesari - our humble tribute to the martyrs of Saragarhi. 'Aaj meri pagdi bhi Kesari... Jo bahega mera woh lahu bhi Kesari... Aur mera jawaab bhi Kesari'," tweeted the 51-year-old actor on Wednesday, 12 September, the day the battle was fought between 21 Sikh soldiers of the British Indian Army and 10,000 Afghan intruders 121 years ago. "Today we remember the heroes! Circa 1897. 21 Sikhs vs 10,000 Afghans. The bravest battle ever fought," tweeted Karan Johar, whose Dharma Productions produces the movie. The first posters of Kesari also confirmed the release date of the movie to be March 21. Parineeti Chopra, who co-stars with Akshay Kumar in the film, also shared the posters on her timeline. The Kesari posters feature fictionalised versions of all 21 of the Sikh soldiers with Akshay taking the center-stage as Havildar Ishar Singh, who lead the Sikh soldiers in the battle. The Battle Of Saragarhi holds a rather significant place in the pages of Indian history. All 21 Sikh soldiers fought to death in the battle against the Afghans, which is often cited as one of the most memorable examples of military last-stands. Tribute is paid to the war heroes every year as Saragarhi Day is celebrated on September 12 as Regimental Battle Honours Day by the units of the Sikh Regiment of the Indian Army across the globe. However, the Anurag Singh-directed Kesari is not the only upcoming Bollywood film that's based on the Battle Of Saragarhi. Ajay Devgn's Sons Of Sardaar and Randeep Hooda's The Battle of Saragarhi are also in the making.